Stuart and James have nearly completed their journey across Iowa, with only two programs left! Make sure to catch the final installments of Dream Green. 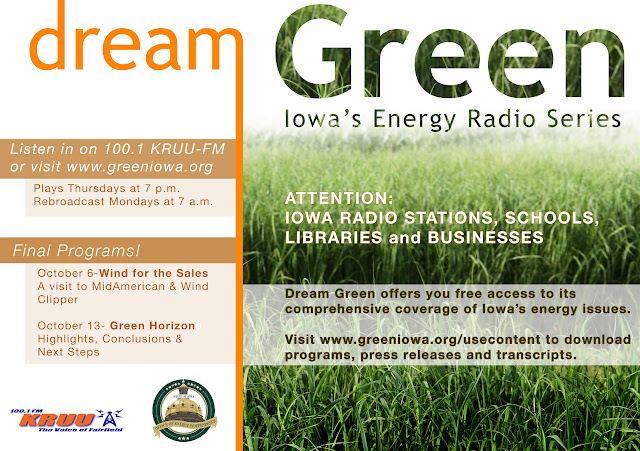 Dream Green will continue as an ongoing resource for schools, radio stations, businesses, and beyond here on our website, greeniowa.org. This educational tool provides a comprehensive database of new and old technologies Iowans are using to power their lives. Take fieldtrips to key locations we've already scouted out for you!